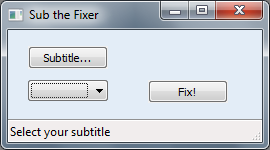 Sub the Fixer is a subtitle fixer for video subtitles int the .srt format. It aims to fix common problems that derive from the use of OCR programs (such as SupRip or SubRip) to convert static .sup image files extracted from DVDs and Blu-rays into editable text, such as the popular .srt format. This program attempts to fix them by applying a series of idiomatic rules, such as not allowing a capital I in the middle of a word. It is written in Python and makes heavy use Regular Expressions. It also uses the wxPython GUI libraries, the python bindings of the portable and multiplatform wxWidgets project. Example: a common mistake is confusing lower-case l with capital I, especially when using the arial font. l saw a Iarge crocodiIe Iast faII, with my friend Ian, who Iives in Iowa. I saw a large crocodile last fall, with my friend lan, who lives in lowa. There is a problem, then, with proper names (depending on the font you will or won’t see that Iowa and Ian are spelled with a lower-case l), but it is much easier to correct those than to correct every other word that starts with lower-case l and has been capitalized by mistake. It’s probably easy to fix that with a dictionary, which could be added at some point. Currently, the program supports 7 languages which use roman-derived alphabets, with specific rules applied to them. English, Spanish, French, Italian, German, Polish and Portuguese. The current version can be found here. Bear in mind you need to install wxPython for the GUI to work. As there is no support for Python 3, you should use either Python 2.6 or 2.7. I have not tested all possible cases, in case you find a bug let me know.